How ordinary it seemed at first, a museum—the word is important—on the outskirts of the little industrial town of Oświęcim, or Auschwitz in German. Coaches and cars in a parking lot. A modest snack bar, some buildings. We could see the entrance; walked toward it and through it. How low it was, the terrible sign over the gate: ARBEIT MACHT FREI. The camp orchestra played there, by the side of one of the barracks. The scale of it is shocking, people say, but I was struck by how small it was, the original Auschwitz, or Auschwitz 1. 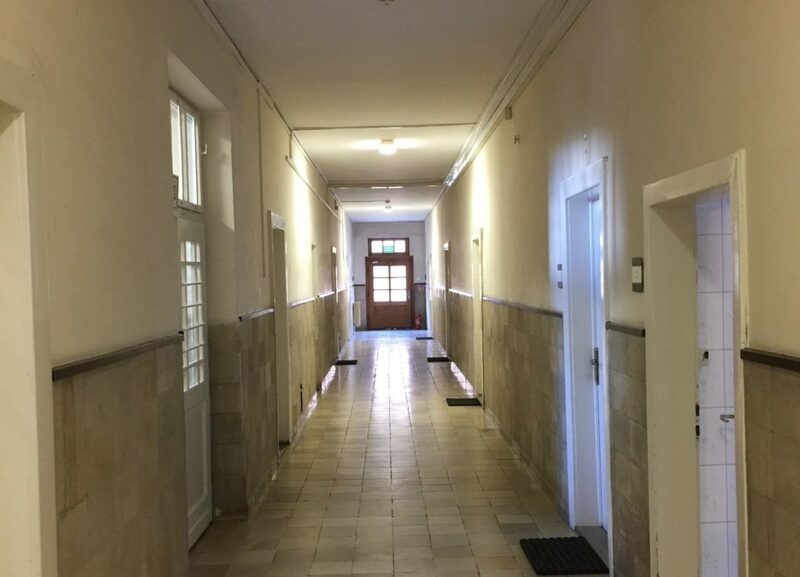 Mordecai Lichtenstein, a survivor, called it a “show camp” in his testimony to the Jewish Central Information Office in May 1945, and perhaps it was, at one time: tidy rows of two-story brick Polish army barracks, built in the twenties and thirties. Tiled stoves in large rooms. Wooden floors. The prisoners slept on the floor, on straw and coarse canvas. Washrooms. Rows of toilets. The kapo, the block eldest, had his or her own room: a narrow single bed, a chair, a table. We walked upstairs. An ordinary municipal staircase, worn down by millions of feet walking up these steps toward the piles of human hair, the shoes, the glasses, the leather suitcases. There’s a textile on display, too, an unfinished and now somewhat disheveled grayish-brown blanket or rug, woven from human hair. It has been proven to contain traces of Zyklon B, our guide says, a young blond woman who speaks from a script, though without notes. We hear her through our headsets, along with the faint echo of other guides. Other groups, other people, push toward us; thousands of people slowly walk through these rooms every day. Zyklon B crystals in a glass case. A pile of tins, opened with a circular cut through the top. I wondered how they did it, how they opened the cans, with what instrument. They wore gas masks, I suppose. I want to describe the next thing, but I blank on the word: gallows. A shuttle bus takes us to Birkenau nearby, past birches and poplars. The railway line ran into Birkenau, a dead-end track without a platform or station. A cattle truck is on display, a carriage of the kind that used to transport animals and later transported people. Rough planks, innocent in any other context. The sun disappeared behind dark clouds, and suddenly we were walking in gusts of rain. M lent me her jacket. I thought she must be cold herself and tried to give it back, but she refused to take it. By the side of the monument to the victims, dating from 1947, is what is left of the gas chamber. The camp authorities blew it up days before liberation. We walked back into Birkenau, into one of the barracks—here are the three-tiered bunks we know from photographs, emaciated faces turned toward the camera. There is a punishment block where people were locked up for days without food or water before they were gassed. They must have seen all the trains from here, the long lines of people walking up toward the gas chamber. Barking dogs, coarse shouts, whips. The river—is it the Vistula?—runs not far behind; there is a sense of marshy wetland about Birkenau, a flat expanse. Silence. Just outside the electrified fence—the voltage at one time high enough to kill you—there are low watchtowers, cement uprights curving slightly inward. Beside the gas chamber is a small, rectangular, dug-out pond, where human ashes were dumped. After the tour we had coffee in what was once the SS canteen with Andrzej Kacorzyk, the deputy director of the Auschwitz Museum. Museum staff have offices in the building where the camp bureaucrats worked. The Director lives in the commandant’s villa. Had this been a normal museum, these houses would surely have been part of the display. Probably the housing for the guards would have been shown, too—where did they live, and how? Auschwitz is frozen in time, but what time? The seventies or eighties, perhaps. Some time after the sixties and before 1989. My Ph.D. was about a collective farm in Estonia, and I recognize elements of different eras here, communist and postcommunist. Change must, of course, be an enormously controversial issue in Auschwitz. How do you “update” this place? How long will the shoes last, the hair and suitcases, before they turn to dust? How long will the staircases of Auschwitz last before they are worn down by shoes, eroded by one foot in front of the other? Perhaps this slow decay, this half-life of Shoah artifacts, is how it should be. The little town of Oświęcim carries on in its terrible normalcy, its music festival and McDonalds, its railway lines and rotaries. And yet, how could it be otherwise? A controversial Polish law of last year dictates that Auschwitz must not be referred to as a Polish death camp, at a time when anti-Semitism from right and left is creeping back. But Auschwitz, of course, was a Nazi site, created in the very center of expansionist Germany. Some 1.1 million people, transported from east, west, north, and south, were murdered here: 73,000 ethnic Poles, 27,000 Roma, and the rest, a million people, were Jews. Nearly half were Hungarian Jewish: 424,000 people, murdered in the spring of 1944. There is so much you don’t learn at Auschwitz—they spare us, and perhaps they have to spare us. The guide’s script is a rhythmical incantation to remember, but there are not many details, other than numbers—kilometers of fencing, numbers of barracks, calories per day, numbers of the dead. The formerly Jewish part of Kraków: groups of elderly Germans sit in synagogues, enormous sadness etched onto their faces. Cemeteries. A bookshop. Hebrew lettering here and there; dying remnants of a culture long since destroyed. The Jewish revival, such as it is, is a project of remembrance and mourning. The flea market a few streets away was a relief after that. Impoverished people sell old things; a palimpsest of eras, a puzzle of remains. What does it all add up to? Enduring life, perhaps. Drunken faces, light blue eyes, red hands, black shoes worn gray. Someone looks at the sky and wonders, Will it rain? Two older men huddle together, gossiping. A blond Ukrainian woman sells old plates, smiles politely, blows on cold hands. How appropriate it feels in retrospect, that sense of being managed through Auschwitz, of being herded along, wearing a sticker on your coat, the waves of people walking to the end. How lucky we were, to walk to the end and then back, to join the shuttle bus, to find a seat, a little cramped, it’s true, but still a seat, and then to have coffee in the old SS canteen with the museum’s deputy director, good coffee, and three kinds of biscuits. M and I ate one each, swallowing discretely, discussing current Polish politics, the new nationalism, the state of human rights in Poland. M has lectured and published widely on human rights; she has seen most things, but not this. I’m writing this in a hotel room in Warsaw. We have seen the editors of a literary quarterly and visited the offices of human rights organizations, we’ve had numerous conversations about contemporary Poland, but Auschwitz is growing inside me. I pull my hair over my mouth, haunted by the tidy kapo’s room; the blanket of hair with traces of Zyklon B, that unfinished thick gray fabric in a glass case. It reminded me of countless other displays in the ethnographic open-air museums that sprang up all over Europe toward the end of the nineteenth century and in the early twentieth, uncanny echoes of other representations. Here is the bed and the chair, the tin tableware and the kitchen stove. This is how the peasants knitted. Here are the rugs, there are the blankets. This is how they wove. Auschwitz is both a memorial and an open-air museum, a place in which to remember and a place in which to learn. The mechanical phrases of our guide, the repeated reminders that we are here to learn and remember so that this may never happen again, were oddly comforting: I was relieved to hear the lifeless script, relieved to have my headset, to be alone and protected from the objects on display in the rooms we walked through, to be one of many in the line of people shuffling through the punishment cells, the dark, dank locked spaces where people were killed. Sometimes the wordlessness at the heart of trauma is a relief, allowing for some small dose of denial. There were candles and plastic flowers in one of the rooms, a memorial to Maximilian Kolbe, the priest who volunteered to be killed in place of another man. He survived for a long time without food or water—the possibility of miracles is conjured up, we remember Catholic Poland, nationalist Poland. He was killed, eventually, with an injection of poison into his heart. Afterward, I wanted to burn my clothes. Shower and wash my hair and brush my teeth and throw away my shoes. I wanted to get rid of every trace of Auschwitz, as though I had never been there. I remember, now, the word: gallows. It was a simple construction: a square metal pole welded or screwed onto two metal uprights. They hung people there. I don’t need to write that. Sigrid Rausing is the editor of Granta magazine and the publisher of Granta Publications. She is the author of History, Memory, and Identity in Post-Soviet Estonia: The End of a Collective Farm and two memoirs, Everything Is Wonderful and Mayhem, both translated into several languages.